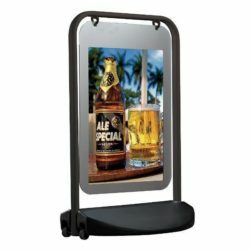 Media Size: 8.5" x 11"
Viewable Area: 7.79" x 10.29"
Curved Sign Holder with Acryled is suitable to use in hotels, galleries, museums, restaurants, lobby, bars. Available in various portrait and landscape sizes and positions. 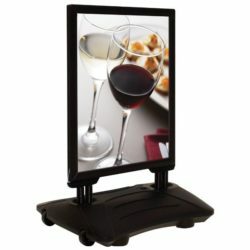 The edge-lit Acryled mounts on Curved Sign Holder both portrait & landscape. Special treated acrylic and LED technology illuminates prints homogenous. Poster placed in position by 2 clear clips on 2 short sides. 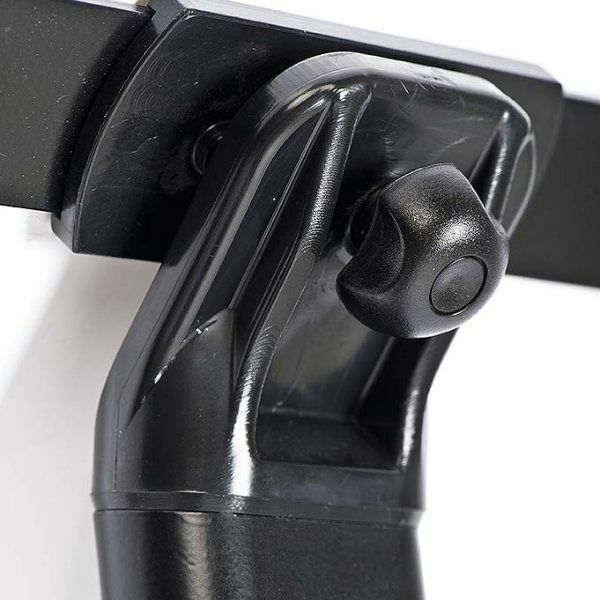 Packed unassembled with an easy-to-understand instruction sheet & fixing elements. All units pass UL/CE PAT test. Packed with quality certificates & 11,48 feet (3,5 meters) electrical cable. Led illumination saves up to 60% energy cost. Heavy base provide stability. This menu stand with its illuminated frame is an important progress on the traditional floor-standing sign holder! 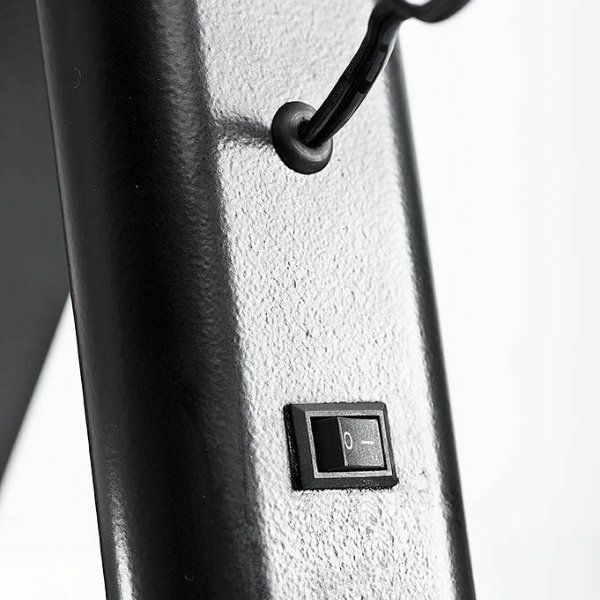 It’s this LED lighting which lights up the acrylic signage place of this item. It’s more impressive that catching the boss’s attention and leading them into a shop or a restaurant with a menu stand for example like this food advertisement, which is illuminated. 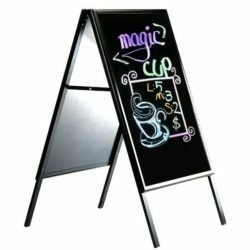 With the help of LED lighting the beveled edges of the acrylic advertisement plate brightens too. 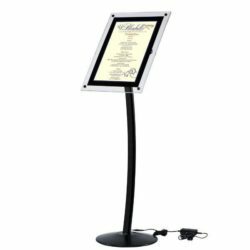 This menu stand which leans, you may have heard it as a sign holder too, is more fascinating than identical advertisements because of it’s light effect which is created by the illumination on the beveled acrylic plate. 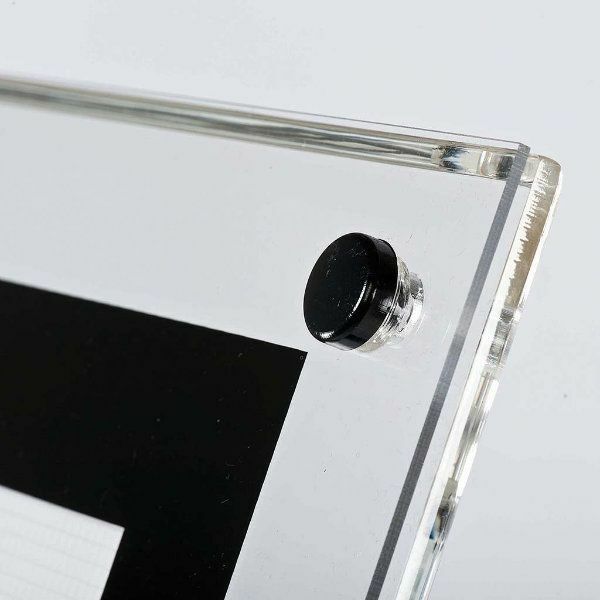 By enclosing the signage place the frame’s thickness is 3/8″ and it creates an 1-1/4″ extensive boundary. 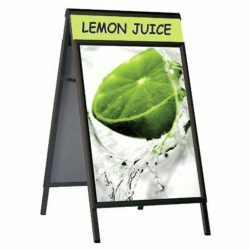 There is a brightened sign coat of this menu stand which has a speciality as a light scattering model and it also makes you feel comfortable about brightening each advertisement equally without making any shadows or hot&cold spots.They have taught about another feature that makes informations read easier by clients by serving a perfect angle. 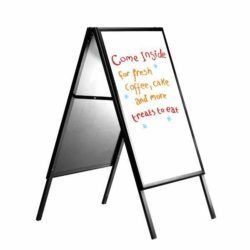 There is a metal bottom and a rod with a black end of this sign holder, LED menu stand and to be sturdy it’s steel bottom has diameter of 14-1/8″. 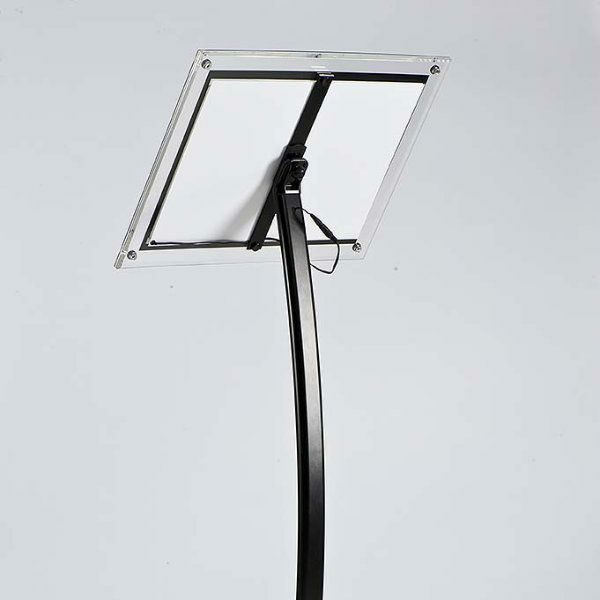 The menu stand has a twisted pole made from acrylic, and the bottom has a steel structure. 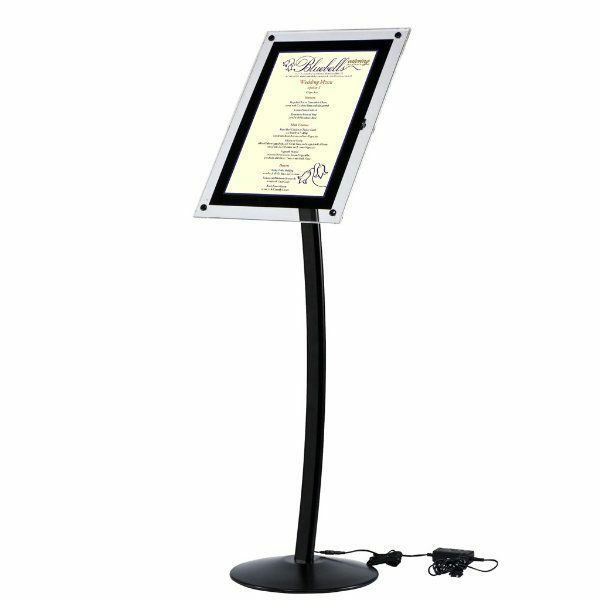 For putting external places of the restaurants, there is a low-cost but with a luxurious look of the menu stand which is necessary to advertise menus. As an extra speciality, each electronic element is CE/UL PAT tested and certified. 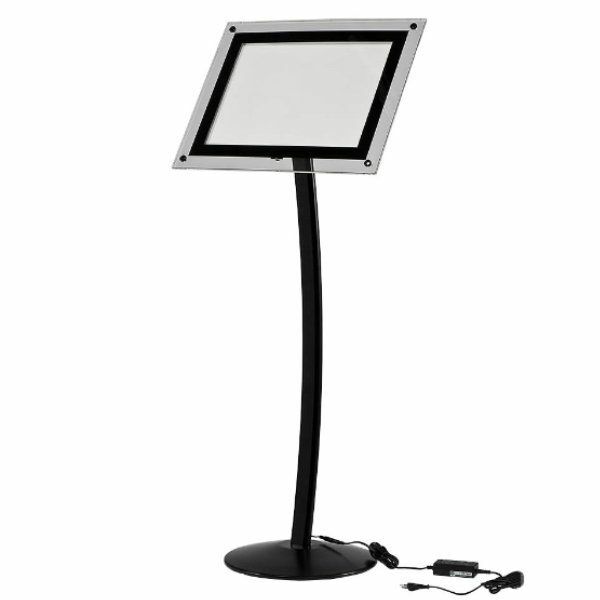 The freestanding menu stand design and lightness of this advertisement simplifies the resettling if need anytime. This unit has an enduring structure and a new age type with its illuminated surface, which makes a sign frame ideal for advertising menus. Using it for office announcements it is strong good quality easy to assemble and better quality than my previous one.